There’s no denying that social media has drastically changed the way people communicate, shop and experience the world. But as consumers look to social media and other digital channels to discover products, make purchasing decisions and interact with brands, what types of content do they seek and trust most? As it turns out, it’s not the content brands are spending lots of money to produce, but the content consumers themselves are creating and sharing online everyday – user-generated content (UGC). Stackla recently surveyed 1,590 consumers and 150 B2C marketers from the U.S., UK and Australia, to uncover the gaps that exist between the content consumers want and what marketers believe they’re providing – the results of which should serve as both a warning and an opportunity for marketers everywhere. Though it probably won’t come as a big surprise, ad-exhausted audiences are increasingly looking for authenticity. A whopping 90% of consumers said that authenticity is important when deciding which brands they like and support – up from 86% in 2017. 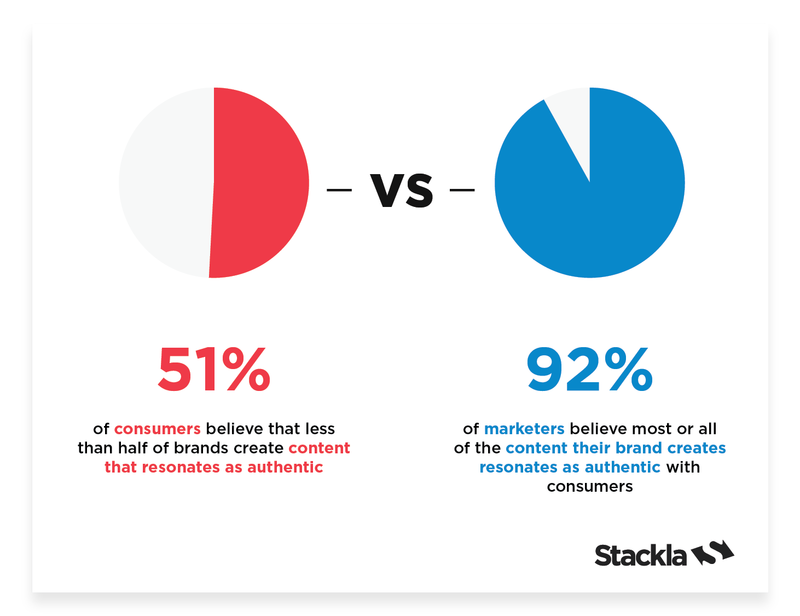 And marketers understand how much authenticity matters, with 83% saying authenticity is very important to their brands, and 61% believing authenticity is the most important component of impactful content. So just how authentic and effective is the content brands are producing? That depends on who you ask. An overwhelming 92% of marketers believe that most or all of the content they create resonates as authentic with consumers. Yet the majority of consumers disagree, with 51% saying less than half of brands create content that resonates as authentic. How can marketers be so off-base when they clearly recognize that authenticity is what consumers seek? The answer can be found in the types of content marketers view as authentic. User-generated content is viewed as the most authentic form of content by consumers globally, with 58% of consumers agreeing. Marketers are on a different page. While consumers are 2.4x more likely to say UGC is most authentic, when compared to brand-created content, marketers are 2.1x more likely to say brand-created content is most authentic in comparison to UGC. Herein lies a crucial issue for marketers – they believe that authenticity is the most important component of effective content, yet the content they perceive to be most authentic – brand-created content – is not the content their audiences views as most authentic. Beyond being seen as the most authentic, user-generated content is also the most influential content consumers reference when making purchasing decisions. 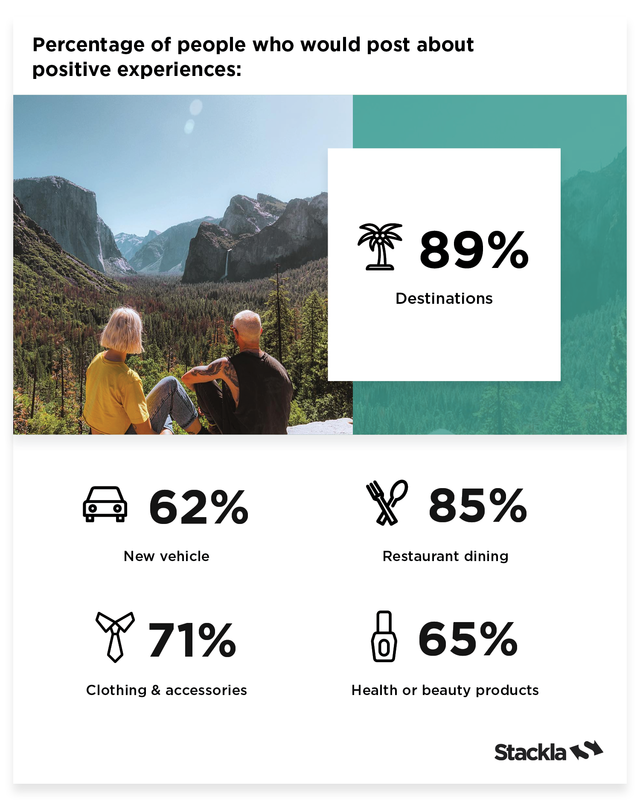 Most consumers say that they’ve made purchasing decisions based on user-generated visuals – 57% have made plans to dine at a particular restaurant, 54% have purchased a consumer packaged good and 52% have made plans to travel to a specific destination based on a consumer-created image or video. 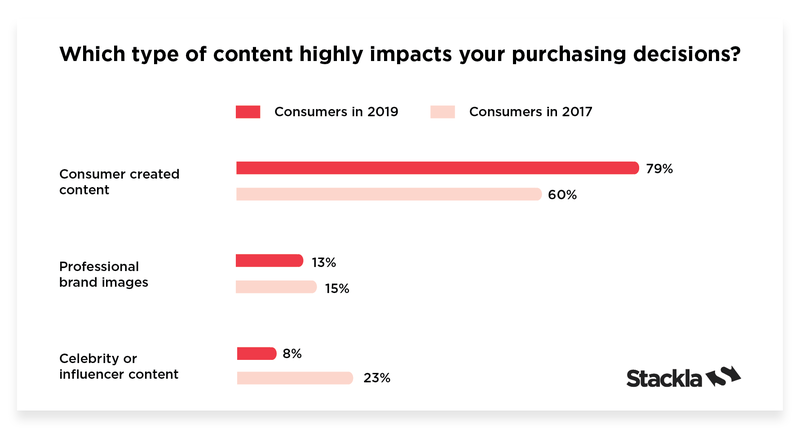 Globally, 79% of people say user-generated content highly impacts their purchasing decisions – up from 60% in 2017 – while only 13% say content from a brand is impactful, and a mere 8% say influencer-created content would highly impact their purchasing decisions. The waning influence of celebrity and/or influencer content is an indicator that everyday consumers’ trust in social media influencers has been shaken in the wake of numerous reports of fake and fraudulent influencer behavior (we’ve all seen at least one of the documentaries on the Fyre Festival at this point, right?). But although consumers find user-generated content 9.8x more impactful than influencer content, nearly half of marketers (49%) are planning to increase their investment in influencer marketing in 2019. Seeing as the cost of influencer marketing can range anywhere from $250 per Instagram post to upwards of $500,000 per YouTube video according to Digiday, this may not be the most effective use of brands’ marketing dollars. The punishing pace of today’s news and technology cycle has deepened the content challenges of modern marketers. Now, not only do you need to produce more compelling and visual content to break through in an increasingly cluttered landscape, but you also need to ensure that content is always fresh. Half of marketers say producing or sourcing enough engaging visuals is a top content challenge, and 63% feel pressure to continually produce greater amounts of content at a higher frequency. But the greater the demand, the more crucial it is to prioritize the content that’s going to be most effective at attracting and motivating audiences – yet, 67% of marketers are planning to increase their use of brand-created photos and videos in 2019, although only 15% of consumers say that’s the type of content they most want to see from brands. So what type of content do consumers want from brands? You guessed it: UGC. Fifty-six percent of consumers say the types of content they most want to see from brands are user-generated photos and videos – and they’re constantly creating them. While marketers are increasingly struggling to create enough content, everyday people have become the world’s greatest content creators. The majority of people say they would post about a wide variety of positive brand and product experiences – travel to a destination, dining at a restaurant, using a new health and beauty product or purchasing a new car. And most are sharing these experiences with the hopes that brands will notice, saying they would not only welcome, but reward brands for using the content they create. In fact, 51% of people say they’d be more likely to continue engaging with and/or purchasing from a brand if it shared their photo, video or post throughout its marketing. In order to bridge these gaps in perception, marketers need to move away from the expensive and time-consuming professional content they currently prioritize and listen to what global consumers have repeatedly declared throughout this report – the authenticity and influence of user-generated visuals are what people seek, trust and act on most. By strategically tapping into the content consumers freely crave and create, marketers can simultaneously solve their content production and authenticity challenges, while also reducing their costs and delivering more relevant, engaging and influential content experiences for their audiences. You can read the full Bridging the Gap: Consumer & Marketing Perspectives on Content in the Digital Age for more insights.